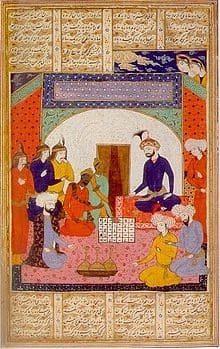 Shatranj (Hindi शतरंज, Arabic شطرنج, from Middle Persian chatrang چترنگ), is an old form of chess, which came to the Western world by the Persians and later Greeks, and ultimately from India via the Persian Empire. Modern chess gradually developed from this game. The Arabic word shatranj is derived from the Sanskrit chaturanga (catuḥ: "four"; anga: "arm"). In Middle Persian the word appears as chatrang, with the 'u' lost due to syncope and the 'a' lost to apocope, for example, in the title of the text Mâdayân î chatrang ("Book of chess") from the 7th century AD. In Persian folk etymology shat means "100" and ranj means "worries" then it becomes "100 worries", Persian text refers to Shah Ardashir I, who ruled from 224-241, as a master of the game: "By the help of Providence Ardeshir became more victorious and warlike than all, on the polo and the riding-ground, at Chatrang and Vine-Artakhshir, and in several other arts." During the reign of the later Sassanid king Khosrau I (531-579), a gift from an Indian king (possibly a Maukhari Dynasty king of Kannauj) included a chess game with sixteen pieces of emerald and sixteen of ruby (green vs. red). The game came with a challenge which was successfully resolved by Khosrau's courtiers. This incident, originally referred to in the Mâdayân î chatrang (c. 620 AD), is also mentioned in Firdausi's Shahnama (c. 1010). The rules of chaturanga seen in India today have enormous variation, but all involve four branches (angas) of the army: the horse, the elephant (bishop), the chariot (rook) and the foot soldier (pawn), played on an 8x8 board. Shatranj adapted much of the same rules as chaturanga, and also the basic 16-piece structure. There is also a larger 10x11 board derivative; the 14th-century Tamerlane chess, or shatranj kamil (perfect chess), with a slightly different piece structure. Shāh (king) moves like the king in chess. Fers (counsellor; also spelled ferz; Arabic firz, from Persian فرزين farzīn; also called wazīr) moves exactly one square diagonally, which makes it a rather weak piece. It was renamed "queen" in Europe. Even today, the word for the queen piece is ферзь (ferz`) in Russian, vezér in Hungarian, "vezir" in Turkish, "vazīr" in Persian and "wazīr" in Arabic. It has analogue to the guards in xiangqi. Rokh (chariot; from Persian رخ rokh) moves like the rook in chess. Pīl, alfil, aufin, and similar (elephant; from Persian پيل pīl; al- is the Arabic for "the") moves exactly two squares diagonally, jumping over the square between. Each pīl could reach only one-eighth of the squares on the board, and because their circuits were disjoint, they could never capture one another. This piece might have had a different move sometimes in chaturanga, where the piece is also called "elephant". The pīl was replaced by the bishop in modern chess. Even today, the word for the bishop piece is alfil in Spanish, alfiere in Italian, "fil" in Turkish, "fīl" in Persian and слон ("elephant") in Russian. 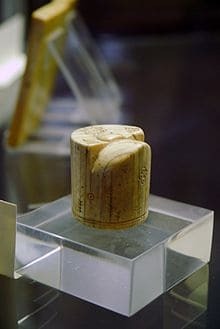 The elephant piece survives in xiangqi with the limitations that the elephant in xiangqi cannot jump over an intervening piece and is restricted to the owner's half of the board. In janggi, its movement was changed to become a slightly further-reaching version of the horse. Asb (current mean of horse in Persian, from old Persian Asp (اسپ)), moves like the knight in chess. Sarbaz (also called piyādeh (پیاده) in Persian and adopted later to Baidaq (بيدق) in Arabic as a broken plural), foot soldier, moves and captures like the pawns in chess, but not moving two squares on the first move. When they reach the eighth rank, they are promoted, but only to fers. There were also other differences compared to modern chess: Castling was not allowed (it was invented much later). Stalemating the opposing king resulted in a win for the player delivering stalemate. Capturing all one's opponent's pieces apart from the king (baring the king) was a win, unless your opponent could capture your last piece on his next move, then in most parts of the Islamic world it was a draw, but in Medina it was a win. During the Golden Age of Arabic, many works on shatranj were written, recording for the first time the analysis of opening games, chess problems, the knight's tour, and many more subjects common in modern chess books. Many of these manuscripts are missing, but their content is known due to compilation work done by the later authors. There is a passage referring to chess in a work said to be by Hasan, a philosopher from Basra who died in 728 AD. The attribution of authorship is dubious, however. Mutaqaribat, proximes - players who could win 2-4 games out of 10 in the match against grandee. They received odds of a pawn from grandee (better players g-, a- or h-pawn, weaker ones d- or e-pawn). Third class - players who received odds of a fer from grandee. Fourth class - received odds of a knight. Fifth class - received odds of a rook. In the opening, players usually tried to reach a specific position, tabiya. Openings in shatranj were usually called tabbiyyaتَعبِّيّة (pl. tabbiyyaat),تَعبِيّات which can be translated as battle array. Due to slow piece development in shatranj, the exact sequence of moves was relatively unimportant. Instead players aimed to reach a specific position, tabiya, mostly ignoring the play of their opponent. The works of al-Adli and as-Suli contain collections of tabiyat. Tabiyat were usually given as position on a half-board with some comments about them. The concrete sequence of moves to reach them was not specified. In his book Al-Lajlaj analyzed some tabiya in detail. He started his analysis from some given opening, for example "Double Mujannah" or "Mujannah-Mashaikhi", and then continued up to move 40, giving numerous variations. The chess pieces were often shaped to avoid any representation of a real living thing. Note that the alfil (bishop) moves two squares diagonally, jumping over intermediate pieces; this allows it to jump over the white knight to deliver the discovered check from the second rook with 2.Bf5+. It was said that a nobleman wagered (playing White) his wife Dilārām on a chess game, and this position arose, and she appealed "Sacrifice your two Rooks, and not me."